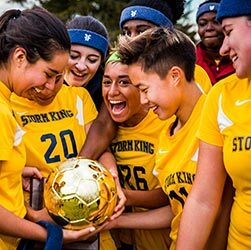 During the coldest months of the year, there is no better time at The Storm King School to focus on college placement, especially for students in the junior class. In the coming months, our 11th-graders will be focusing not only on their studies but also on researching possible career paths and colleges that may be a good fit for them. For Storm King’s senior class, early college acceptances have begun to arrive and many students will be attending their “first choice” in the fall. “Our student-led approach to college placement is a key to their success, and it shows in our college acceptance record. Ultimately, as in other areas of their lives, it is the student who drives the process and puts in the work. We are there every step of the way to give them the tools and guidance they need,” explains Mrs. Kwon.